Welcome to our combined registry! This portal will launch you to our BuyBuyBaby, Amazon & Target registries. I've tried not to duplicate items across registries, so be sure to check each, even if you're not planning to purchase from that specific store. With Baby's R' Us going out of business, BuyBuyBaby is now the most comprehensive store, as such, it is also the most complete registry. 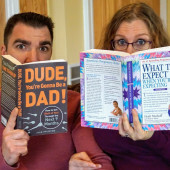 We promise that the gender is a surprise! Don't be thrown by any items in the registry which are labeled with a gender. The nursery theme is also neutral colors and geometric patters in grey, white, teal, with orange accents from foxes & misc. woodland critters. Thank you for sharing this momentous event with us. We can't wait to see you at the shower!